6/30 Cup of Coffee: It was a quiet night offensively for the affiliates, as they went 3-5 in a number of close contests. 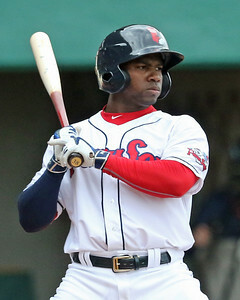 In Pawtucket, Rusney Castillo led the way, while Andrew Benintendi hit his fourth Double-A home run in Portland's loss. Pitching propelled the DSL squads to victories while Salem, Lowell, Greenville and the GCL squad all suffered defeats. Despite out-hitting Rochester, 12-3, Pawtucket narrowly claimed victory. Roenis Elias improved to 5-3, going six innings and allowing two runs (one earned) on three hits and three walks while striking out three. Chandler Shepherd picked up his first Triple-A save, striking out three over three scoreless innings. Rusney Castillo's (pictured, right) two-run home run in the second gave Pawtucket a 2-0 advantage. Rochester battled back with runs in the third and fifth to tie the game. In the sixth, Chris Dominguez brought home the game's winning run on an RBI single. Castillo, Dominguez, and International League All-Star Chris Marrero each had two hits in the victory. It was a woeful night offensively for Portland, as it managed just one hit in a 5-1 loss to Trenton. Mitch Atkins took the loss, allowing three runs on six hits and a walk while striking out seven. Luis Ysla allowed two runs on a hit and a walk in an inning of relief. The Sea Dogs lone hit of the evening came from Andrew Benintendi, who laced a two-out solo home run in the first inning. With the loss, Portland has now dropped seven of their last ten. Offense was hard to come by in the series finale, as the Pelicans avoided a three game sweep. Travis Lakins took the loss, allowing a run on six hits in 5 2/3 innings of work. Jamie Callahan added 2 1/3 innings of scoreless relief, and Simon Mercedes added a scoreless ninth inning, punching out two. The Red Sox managed just a pair of singles and a pair of doubles; they went 0 for 4 with runners in scoring position and left six men on base. A three-run eighth inning was enough for the RiverDogs to squirm past the Drive. Logan Boyd got the start for Greenville, allowing two unearned runs on three hits and three walks in five innings. Marc Brakeman allowed a run on two hits and a walk, striking out four in two innings of relief. Trevor Kelley rounded out the bullpen work, allowing two runs on two hits in an inning of relief. The Drive kicked off the scoring in the second, plating two on an Austin Rei RBI single and a Jeremy Rivera RBI double. The RiverDogs quickly tied the score in the bottom half of the inning, and the game remained that way until the sixth. In the sixth, Greenville grabbed a 4-2 lead on a Rei RBI single and a sacrifice fly from Rivera. Charleston took control of the game in the eighth, using a triple and a two-run home run to take a 5-4 advantage. The Drive out-hit the RiverDogs, 13-7, but left seven men on base and were caught stealing three times. The Spinners dropped their third game in their last four. Enmanuel De Jesus fell to 2-1 as he allowed four runs (three earned) on five hits and four walks in four innings. Former major leaguer Casey Janssen, who is working his way back into game shape, allowed two runs on three hits in 1 1/3 innings of relief. Brad Stone allowed two runs on two hits and three walks in 2 2/3 innings of work out of the bullpen. The Spinners got off to a quick start, jumping out to a 1-0 lead in the first on a Roldani Baldwin RBI single. After the Tigers tied the game in the bottom of the first, Lowell came right back as Yoan Aybar smacked a solo home run to lead off the second inning. The lead would hold until the fourth, when Connecticut plated three to take a 4-2 advantage. The Tigers put the game away with four runs in the sixth. Chris Madera's RBI single in the seventh rounded out the scoring for Lowell. Rays pitching was able to hold the Red Sox offense at bay, striking out 12 and stranding nine. Yorvin Pantoja picked up his first loss of the season, allowing an unearned run on two hits and three walks, while punching out five. Jorge Marban allowed three runs on four hits and a walk in just 1/3 of an inning. Hildemaro Requena pitched well in relief, allowing just one hit and striking out four in 4 1/3 innings. The lone run of the game for the Red Sox came in the seventh on a Yomar Valentin sacrifice fly. Aided by stellar pitching and three Rays errors, the Red Sox improved to 17-5. Edilson Batista improved to 3-1, allowing just a hit and a walk and striking out three in five innings of work. Juan Florentino collected his sixth save, tossing a scoreless ninth inning. With the game tied, 0-0, in the third, the Red Sox plated two on back-to-back singles from Carlos Pulido and Eddy Reynoso. In the seventh, a run-scoring error expanded the Red Sox lead to 3-0. Ramfis Berroa and Pulido each had two hits to lead the Red Sox offense. A three-run first inning was enough to propel the Red Sox. Rayniel Moreno improved to 3-0, allowing just four hits while striking out two in six innings. Andres Jimenez picked up his first save, hurling three innings of scoreless relief. In the first, Pedro Castellanos's RBI double brought home two and Kleiber Rodriguez's added an RBI single. The victory was the Red Sox' third in a row after a mini two-game losing streak. Player of the Night: Rusney Castillo, who has hit safely in four of his last five games, gets the honor after going 2 for 4 with a home run, two RBI, two runs scored, and a stolen base Wednesday night. For the season, Castillo is hitting .242/.294/.335 with two home runs and 18 RBI.